What a gorgeous day in the neighbourhood, Mr. Rogers. It's 28 in the nation's capital. That's 82 for my American friends. And the sun is just beating down. What great weather for the first Saturday of April! 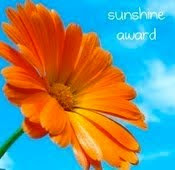 And what better time to tell you that my good friend Cat Lady Larew bestowed a Sunshine Award upon me earlier this week. Isn't that cool?! Thanks CL. I'll tell you what else is cool. The submissions to this week's Pause Ponder and Pun were hilarious. I tell you it gets harder each week to narrow down these captions to just one winner. C'mon honey, it's only until death do us part. I swore I would get married by age 30 no matter what and you...are...it! "It's not that I can't, I just don't wanna do the 'Chicken Dance'!" 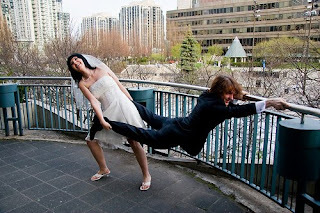 According to the new Health Care Bill, all newlyweds MUST perform warm up exercises prior to the honeymoon to avoid catastrophic medical expenses. Ha, ha, congrats Malisa. You be hangin' with the dufus this week. Good on ya! And Happy Easter!!! Thanks to everyone for playing. See y'all next week. Hey, and click through and visit these guys' blogs. 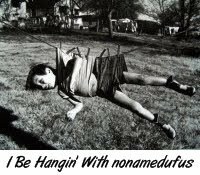 Tell 'em you've been hangin' with dufus. Congrats Malisa, that was hilarious! Wow, Malisa is on a roll! She took a most-honorable mention over at my place today. Congrats Malisa! Normally, I would have thought the winning caption to be funny. Unfortunately, it may be true as well. Government at it's finest! Ziva: I thought so too. Congrats on your honourable mention. Me-Me: She's hot this week. Don: That's what made it so funny! Thanks for honorable mention, dufus! 00dozo: Congrats. You came this close to winning it! Good caption. Congrats on the winning caption Malisa. I love the way your mind works. Leeuna: Wasn't that a good one? CL: Not bad, huh? Hey, thanks for your Sunshine Award. I'm honoured you would think of me. Congrats to Malisa!! Funny stuff! Congrats Malisa! That was really a good one! Well done! Congrats on a job well done Malisa! Jingle: Um, this was Saturday's post. The "yellow" post was Thursday. Jingle: Nice pics and haikus! Skye: Hey, how are things in Manitoba? We've had temps over 80 this weekend! Happy Easter, Skye. Well, they say preventive medicine is best, I guess. Congrats Malisa! Happy Easter to you as well Sir. Temps here are reaching the high teens translating into the 40's for those who read English and not Canadian...lol. Now if I can just get my add a new post page to open fully, I'll be able to put in a post about what I've been doing the last little while. Work aside of course! Mike: Absolutely. Hope you had a great Easter. Skye: Not quite as warm where you are. Good luck with your technical problems.